These awards further add to the choir group’s long list of achievements in international choir competitions which includes the Gold Medal at the 50th Internationaler Chorwettbewerb in Germany in 2013, and 1st place in the folksong and mixed choir categories at the 3rd Bratislava Cantat I International Choir Festival in Slovakia in 2015. 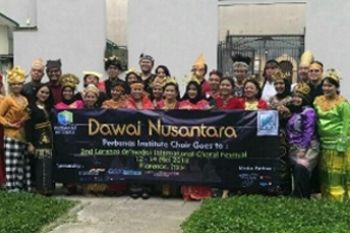 Such accolades demonstrate the choir’s standing as one of the most prominent choir groups in Indonesia. Perbanas Institute’s recent achievements at the Lorenzo De’ Medici International Choir Festival illustrates the institute’s commitment to providing students with a conducive learning environment that hones their academic potential as well as supporting their passion for extra-curricular activities; thereby offering the widest outlook on their future professions.